Zucchini plants always grew like wild monsters for my family. Despite out abundant harvest, I only knew of three different ways to prepare zucchini, while growing up. Battered with flour, cornmeal, salt and pepper, then fried over the stove. Skewed and grilled with cherry tomatoes, onions, bell peppers and spiced beef. 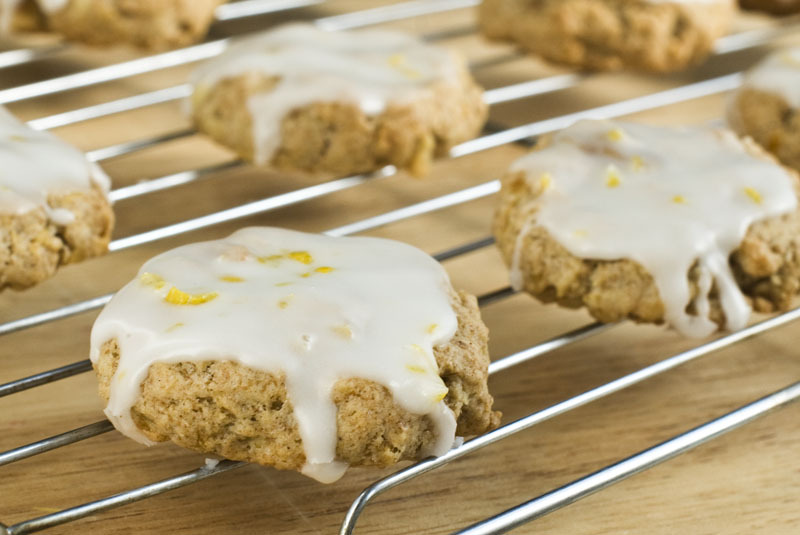 Grated and baked into mom’s special lemon drop cookies. Of course, I know now that zucchini recipes are endless, but cookies were and still are my favorite! Unfortunately, Jonathan and I don’t get enough sun to grow monstrous zucchini vines. Luckily enough by mid or late July, farmers are practically giving it away at markets. Like my mother I grate it, place it in zip-bags and lay it flat in the freezer for another day. Mom usually has the Lemon Drops baked and out by November or December. I’m a bit late. I actually forgot all about my zucchini until I cleaned the freezer last week. Opps. When my mom bakes, she bakes for the neighborhood, so I’ve cut down the recipe and added a few tweaks. I love the lemon and cinnamon flavor together, the moist and crunchy texture and especially the little green specs from the zucchini skin. You are welcome to skin the zucchini, but I’m sure my mom grated everything. As a kid, I thought the green specs were the best part of the cookie’s appearance. These Lemon Drops are even more special, because my mom made them vegan for me when I was in college. She’s always known the importance of dessert to people of all diets and experimented rather than leave me out. 1: Preheat oven to 375°F. Lightly grease cookie sheet or prepare with parchment paper. 2: In a medium bowl, sift together flour, baking powder, baking soda, salt and cinnamon. 3: In a large bowl, cream together sugar, oil and margarine. Beat in zucchini and lemon zest. Slowly incorporate flour mixture until blend is creamy. Fold in nuts and raisins. 4: Drop Tablespoon-size balls of dough onto cookie sheet 2-inches apart. Bake 8-10 minutes or until golden brown. Cool on a wire rack before applying lemon glaze. 5: To make Lemon Glaze: Whip together powdered sugar and lemon juice until smooth. Stir in lemon zest. Store in an air-tight container to keep fresh, up to 3 weeks or freeze up to 6 months. Cookies are also delicious right out of the freezer! Looks good with the frosting! Looks like zucchini can really be added into desserts. The first time I heard about zucchini muffin I was like, what?! But it tastes good so I guess it will be good in your cookies. This looks delicious! I have an old family recipe for zucchini bread but I never tried zucchini cookies. Thanks!